Cut the ends off the eggplant and discard them. Cut each eggplant into 1/4-inch round slices and sprinkle salt over each of the rounds. Place in a colander for 30 to 40 minutes. Rinse eggplant rounds under cool water to remove salt. Dry with paper towels. Meanwhile, spread the flour out on a large platter. Coat each slice of eggplant with flour and shake off excess. Set aside. In a shallow bowl, whisk the eggs together with 1/2 cup cup of the grated Parmesan cheese, the parsley, and the salt. Dip the eggplant, a slice at a time, in the egg mixture and let any excess drip off. Deep-fry the eggplant slices, 3 to 4 at a time, for about 3 minutes, or until they are golden brown and tender. Remove them with a slotted spoon and place them on paper towels to drain and cool. Spread 1 cup of marinara sauce over the bottom of a 9x13 baking dish. Arrange a layer of eggplant slices over the sauce (they can slightly overlap, if necessary). Spread a thin layer of marinara sauce over the eggplant. Sprinkle 1/2 cup of the mozzarella and 1 tablespoon of the Parmesan cheese over the sauce. Repeat, layer the eggplant, marinara sauce, mozzarella, and Parmesan cheese to top the pan. 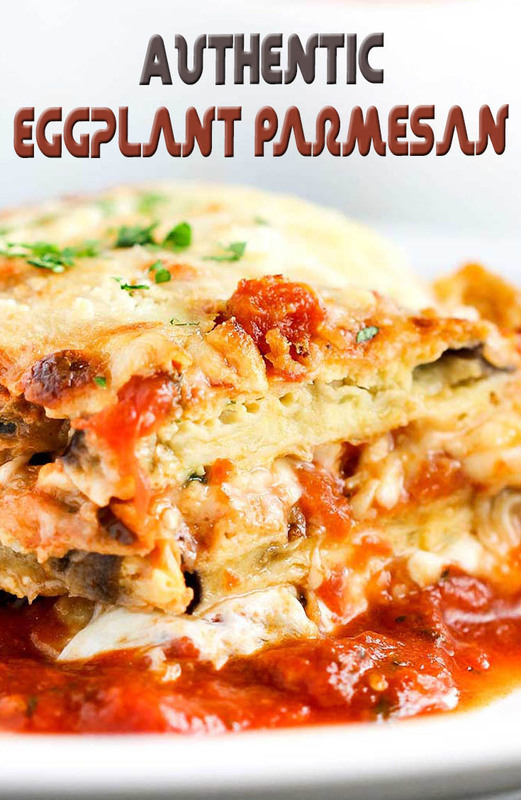 End with a layer of eggplant and about 1/4 cup marinara sauce spread over the top of it. Sprinkle a good handful of Parmesan cheese on top of the sauce. Bake the eggplant for about 50 minutes, or until bubbly and lightly browned on top (you can place under the broiler for a minute or so to brown the cheese, also). Let the pan sit for 30 to 40 minutes until cool enough to serve. Cut into slices and serve with warm marinara sauce and grated Parmesan on the side.